Fulton Family - Robert Howard Fulton Sr.
Home > Samuel & Eliza Fulton Family > David Fulton > Robert Howard Fulton Sr.
Children: Paul, Ivan, Ruth, Charles, Robert, Shirley, John (Jackie), Thomas. Robert Howard Fulton, born in 1889, also became involved in the oil business. 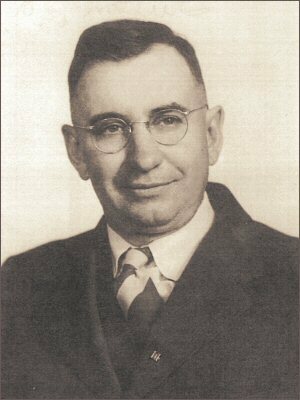 He had a large family and eventually moved to the new, at the time, oil fields in Oklahoma. 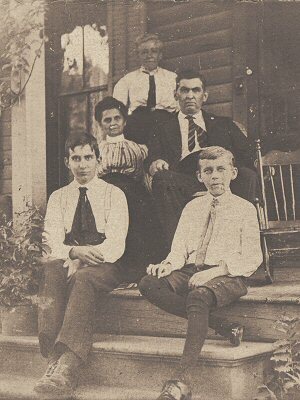 Front L-R: Robert Howard Fulton Sr. & Clarence Fulton about 1904 at 47 South Drake Street in Titusville. 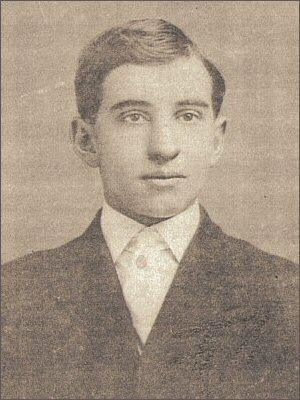 PA.
Robert H. Fulton, Sr. as young man.